You begin your vacation on the drive to the cabin.See spectacular mountain views as you descend past Historic Fort Stover. Once at the cabin you will open up to a lovely, well equipped kitchen,tiled floor,copper ceiling,dishwasher..Enter the living area, with a gorgeous hand made rock fireplace,with built in entertainment center,new 50 inch flat screen TV, a queen size sleep sofa and loveseat..Go into the dining area,up the wrought iron spiral staircase leading to the loft area,with large beams where there is another queen bed and a half bath. French doors and hardwood floors lead to the sun room and bar area with lots of extra seating and a ping pong table and boasts spectacular views of the river just steps from the deck. 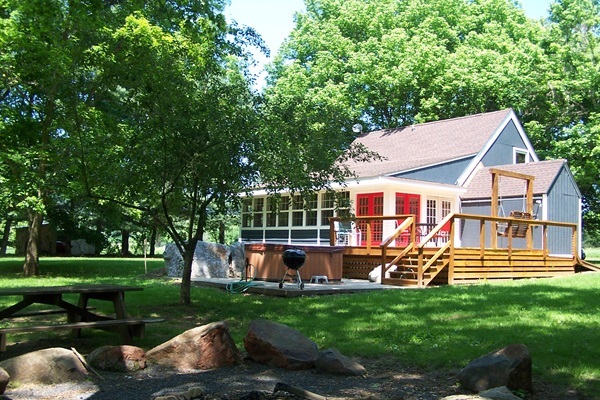 The large new deck area calls out for romance and relaxation.There is a 2 person porch swing and a brand new 6-person hot tub with over 50 jets!For your barbecuing needs there is a charcoal grill,or if cooking with sticks is more your style, go to the bonfire area,roast marshmallows under the stars. Fish, Swim,Tube or just relax. There is also the large yard for some touch football or fetch with your pooch. Open the doors to year round entertainment.Located right on the banks of the Shenandoah River,Swim,fish,kayak,canoe or tube.There are dirt roads offering nice bike riding and the cabin is just minutes away from trails of Shenandoah National Park.Located in the heart of the beautiful Shenandoah Valley you can horseback ride, visit Luray Caverns,the zoo,or vineyard and antiques. In the fall enjoy the beautiful foliage and in the winter you can ski at Massanutten, or Bryce Ski Resorts.